Junuary. That’s what people were calling our decidedly unsummerlike weather a few weeks ago. But July is here now and so is the sun. The next week is bringing temperatures over 75 and even over 85 degrees. For us, dwellers of a third (top) floor condo, where the heat rises and stays for a nice long while, turning on the oven to make dinner is objectionable. This time of year salads seem more sensible. But for a salad to be a main dish, it should be hearty and filling, not light and feeble. And protein is key, which for vegetarians generally means beans, cheese, nuts, seeds, or soy. Based on those considerations, I’ve got three cool, crunchy and refreshing bowls of greens and goodness to share with you that come together for pretty quick dinners. All have at least 15 grams of protein and less than 450 calories. I built this salad around Trader Joe’s Black Bean and Cheese Taquitos, with a taco salad in mind. I only used sour cream as my “dressing” because I like my salads a little on the dry side, but salsa would be a natural addition, too. 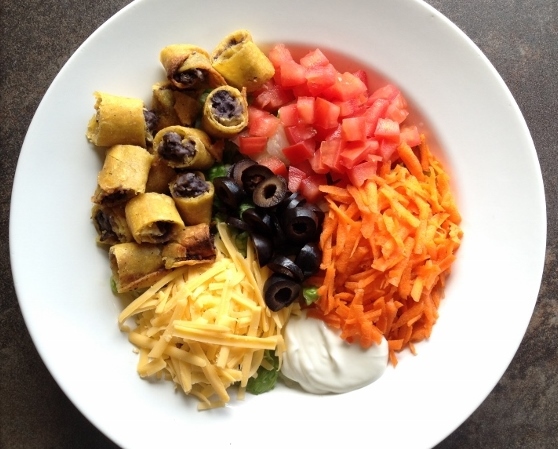 A convenient and vegetarian twist on the traditional taco salad. Place romaine in a large salad bowl and top with carrot, tomato, cheese, olives and sour cream. Once taquitos are cooked, cut into small bite-sized rounds and add to salad. Enjoy! I think this one wins for prettiest salad, and it’s got a great mix of flavors and textures. When I made it this week I used a new kind of lettuce from the farm stand called French Crisp. It had the crunch of romaine with the curly ends of a green leaf lettuce, so it was basically perfect. I modified a favorite dressing recipe that’s similar to the poppy seed one traditionally poured over a spinach and strawberry salad, but I think any homemade sweet vinaigrette would pair well. And as the name implies, mine’s got sugar in it, but it turns out to be less than 1 tablespoon per serving, and it really brightens up the flavors of the berries. In a pinch, I also really like Brianna’s Homestyle Blush Wine Vinaigrette. Colorful, sweet, and delicious. Perfect for a summer evening dinner. Combine all dressing ingredients in a high-sided bowl or quart-sized glass measuring cup and blend with immersion blender. You will have leftover dressing, but it keeps well in the refrigerator. 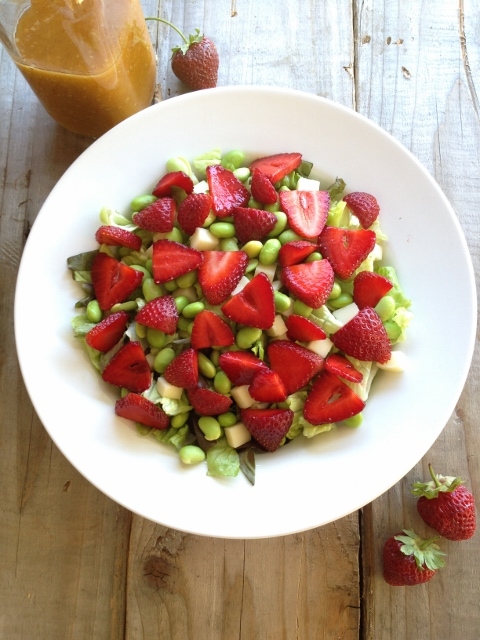 Combine all salad ingredients in a large salad bowl and toss. Enjoy! My salad dressing recipe is a modified version of a photocopied page from an unknown cookbook I got from a friend several years ago. It's called Springtime Salad and the author is Shirley Gunhus. Thank you Shirley! This salad can be a little bit homemade, or a little bit quick and easy (or a little bit country or a little bit rock and roll) depending on the state of things. Normally, I would make my own croutons from leftover whole grain bread, but this time I used a handy shortcut: croutons from the salad bar at the Food Co-op. I got enough for two salads and it only cost me $0.88. Boy howdy. You could also make your own Caesar Dressing, like this vegan recipe which I love, or you can take the easy way out and use bottled dressing. My favorite is Annie’s Organic Caesar Dressing. And, I know that we’re supposed to be moving away from processed foods, and fake meat patties are indeed processed, but I keep several boxes in the fridge for a protein boost when I’m too lazy to cook beans or tofu. MorningStar Farms’ breaded chicken-like patties work perfectly for this salad. However, when taken with the croutons and dressing, the sodium for this dish is high. If you’d rather take a whole foods approach, you could make your own dressing and croutons and have control over the salt. 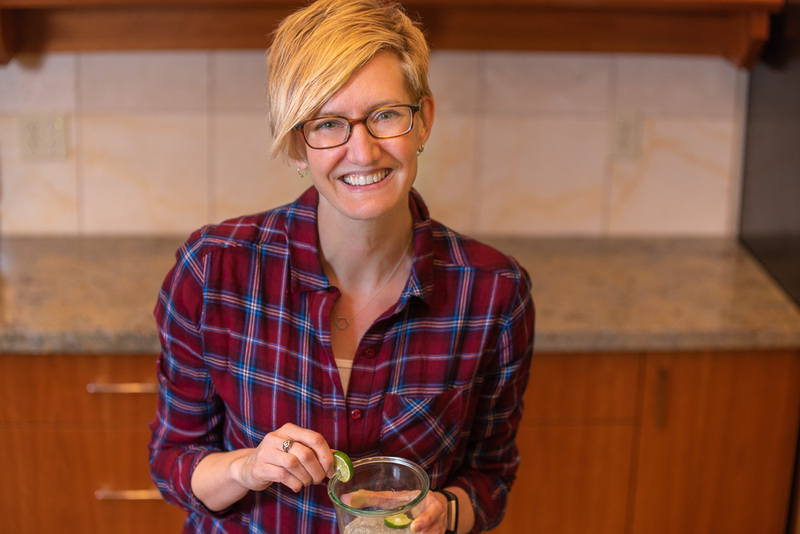 You could also follow the lead of a local restaurant, Boundary Bay Brewing Company, who serves a version of their Caesar with perfectly golden tempeh cubes. 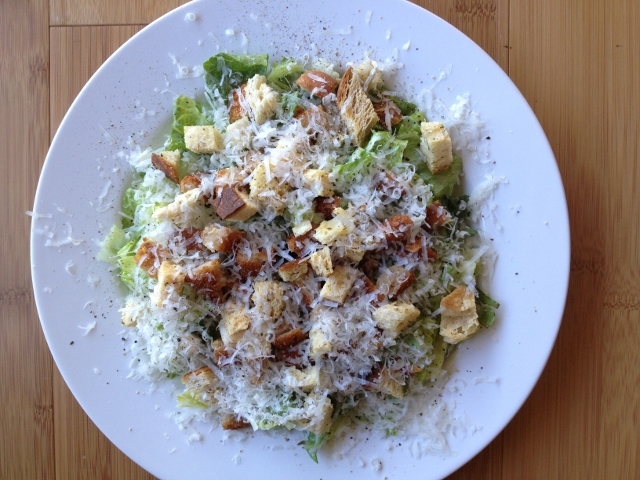 My vegetarian take on the classic restaurant dish, the Chicken Caesar. Cook Chik Pattie according to package directions. (I like to use my toaster oven.) Then let rest for 2-3 minutes before cutting into very small pieces. Toss romaine lettuce with dressing until well coated, and place in large salad bowl. Top salad with Chik Pattie pieces, grated cheese, and croutons. Finish with a sprinkle of freshly ground black pepper. Enjoy! The microplane grater helps get good cheese coverage over the salad with less total cheese, which means less total fat and calories. If you'd like to mix things up a bit from the traditional Caesar, toasted sliced almonds and fresh basil are both flavorful additions to this recipe. If you have your own garden or have purchased a share in a CSA, you probably have an abundance of lettuce about now. So, hopefully you’ll find some salad inspiration in this post, or be encouraged to share your salad ideas in the comments below. 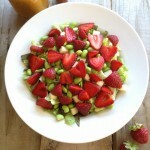 My plan is to try to stay cool crunching away on summer salads for the next couple of months. And daydream about what temperatures must be like on the first floor. What are your top 3 salad toppings…GO! I appreciate how you address the importance of keeping whole foods in our diets and using less processed foods, but I agree there are definitely some times when the day is long that I could use a little help in the kitchen from an already processed item — especially if its from a good company. The recipes here are all excellent recommendations and look beautiful! Thanks for being such a great resource. Hi Robin! It’s true – the goal is a totally unprocessed diet, but with work and family and pets, sometimes dinner has to come together in a hurry, so convenience foods can fill in the gaps between our healthier choices to make a meal. So glad you found the post useful. I struggle with salad dressings I like but these sound so good!!! Jeff says to tell you he is going half vegetarian. He loves those chick patties and the morning star farms are the best. Thanks Cuz! Hi Miss Susan. Tell Jeff I totally approve of his half-vegetarian-ness. Hope you like the salads if you try them!